WeHighlights 2018 #4 EN - Emissions – what do I need to know? Emissions – what do I need to know? The new regulations for emissions are flying fast and furious: everywhere, you hear such terms as CO2, methane, NOx, particulates. But what do these concepts mean? What is NOx? What is SOx? What do we need to take account of in shipping? And how can Wärtsilä help with this? “Roughly speaking, you can make a distinction between two categories of emissions: local emissions and greenhouse gases”, says Sebastiaan Bleuanus, general manager of Research Coordination & Funding Portfolio, Technology Strategy & Innovation at Wärtsilä. 'Local emissions cause short-term problems at the location. For example, nitrogen oxides and sulphur oxides, also referred to as NOx and SOx, along with particulates, have an immediate effect on human health at the location. NOx (nitrogen oxides): cause smog and health problems and result in the acidification and over-fertilisation of the natural environment. SOx (sulphur oxides): cause acid rain and encourage the formation of particulates. Particulates: the air pollution that contributes to the development of lung cancer and other health problems. CO2 (carbon dioxide): is part of the cause of global warming. CH4 (methane): is part of the cause of global warming. On balance, it does 28 times as much damage as CO2, but it is much less present in terms of absolute volume. 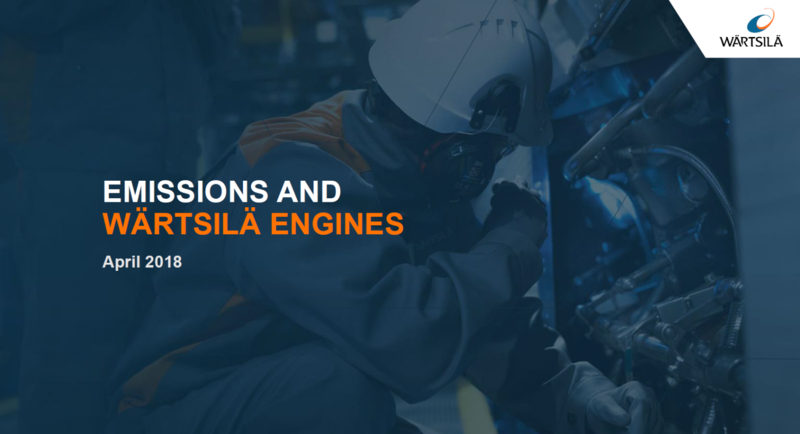 Fill out the form to download the presentation 'Emissions and Wärtsilä Engines'. Lower the ship's energy needs. Take away whatever you don't need. Improve the shape of the hull. Hoist a sail, etc. Use transitional fuel wherever possible, fuel that has as little environmental impact as possible. general manager of Research Coordination & Funding Portfolio, Technology Strategy & Innovation at Wärtsilä.